One of the blogs that i read every day (well, every weekday) is that of Scott Kelby. He is the guy behind NAPP, the National Association of Photoshop Professionals, Kelby Training, and about a hundred great books on photography, Photoshop, Lightroom, and even the iPod. 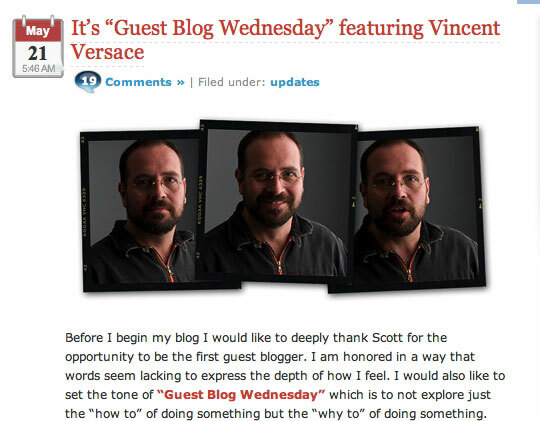 Well, today Scott kicked off his “Guest Blog Wednesday” with a great entry by Vincent Versace. Do your self a favor and go read it here, then keep going back here for Scott’s regular blog entries.